How was the band formed? Sarah and I (Vanessa) have been friends for a long time. Sarah was working a lot as an design engineer and I was in school studying composition. Our work schedules were both very hectic so we weren’t really able to practice our instruments very much. I had started writing songs again after a multi-year hiatus, and had the thought that the best way to get us back to doing what we loved was to just meet up and play the songs I had been writing. We formed LeoLeo not too long after that. Sarah is from Tiverton, Rhode Island. Vanessa is from Los Angeles, California. Could you explain your music to someone that hasn't heard you? Vanessa: We are a hybrid of our influences, especially Brazilian musical styles, Soul, Burt Bacharach era stuff and Radiohead. Vanessa: As Leo Leo our first gig was played in Room 5 - Los Angeles! Is it always the same songs live? No, our live set is always different. Also, we play some of the same songs with different arrangements. Sometimes Sarah plays piano instead of drums or I play Bass instead of only guitar. What has been the best/most promising gig so far? 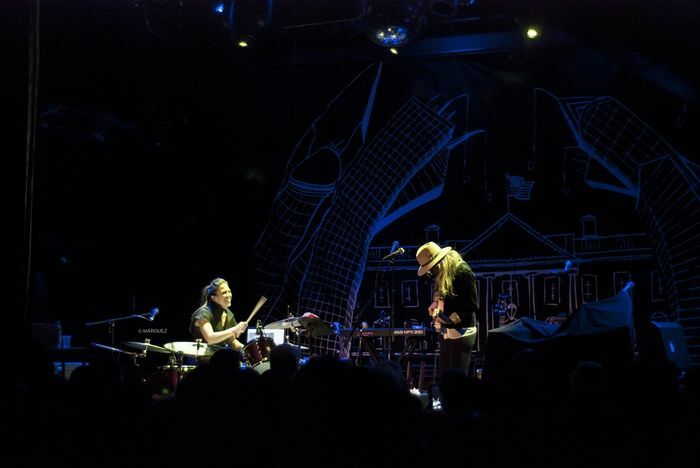 Probably the set we played with Chadwick Stokes at the Bowery Ballroom in New York City. What are the plans for the rest of the year? Record our second EP, play live (possibly a tour), and work on music for clients (we also do custom music work.). We are also working on music for non-profit organizations and endorsement deals with small companies. How do you get psyched up for a gig? Be prepared! Rehearse and book shows with other bands we like! What are your goals with your music? To create, develop as artists, experiment, and connect with people. Is it easier to get your inspiration from older bands or from bands more modern? As far as style is concerned, we are pretty influenced by older bands-soul, Bossa Nova, Funk. Sonically, however, we are very influenced by newer music. Sarah- moods, weather, and relationships. What's the first step when making a new song? Vanessa: I hear notes in my head that I play on guitar. It starts to develop from there. What would be your dreams for the band? To be able to survive off just making music, i.e. writing, touring, recording ourselves and others - all the musical activities. What do you hold most dear? Our friends, family and each other. What would be your greatest fears for the future? There is no sense in fearing the future. Our team keeps up grateful and humbled. We can’t wait to get there! Being too aware of ourselves - too much in our heads. What would you do if there was no music? Invent it. How important are your fans? The most important! What's the funniest/most memorable thing a fan has done for you? We first met Frank Coyne when he ran up on stage during one of our gigs yelling Sarah’s name and pushing the producer of the event out of the way. He is awesome and one of the people we look forward to seeing at our shows. What drives a band that isn't all that famous and renowned to try to make a living on their music and to keep playing? We want to get to a place where we can affect the world.